Pennoni Associates engineer Michael Kissinger talks with residents of the Hamorton neighborhood near Longwood Gardens whose homes have been affected by flooding. 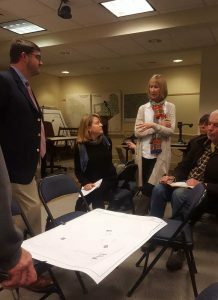 KENNETT – The rains on the plain stay mainly in Hamorton, according to some residents of the village who spoke at the most recent meeting of the Kennett Township Board of Supervisors. Several residents from Hamorton, which is located near Longwood Gardens, shared their concerns about their basements being repeatedly flooded by water from heavy rains, with some noting that the flooding may have been caused in part by drainage changes made in the area. One resident said she had no problems with flooding at her house for 20 years, until July of 2015. During the discussion, Township Public Works Director Roger Lysle introduced Michael Kissinger, an engineer with Pennoni Associates who was also representing Longwood Gardens to address the matter. Kissinger told the board and the residents that Pennoni Associates had studied the drainage system in the area to find the source of the problems. He said radar and video inspections had revealed several blockages due to dirt, leaves, debris, tree roots and other causes, all of which would be expected in an older system like Hamorton’s. “It’s an ongoing issue that we’re working with Roger and Lisa (Moore) on,” Kissinger said, noting that one solution is for those who are affected to disconnect their exterior storm drain system from the in-ground piping and let the water drain out on their lawns. “Nothing on the Longwood property is causing any of the concerns. We found that it’s localized to particular houses,” he added. Kissinger noted that one possible answer would require approval from Longwood Gardens for an easement, but added that the organization is willing to help and that it has paid for all of the studies to date regarding the issue. Board chair Scudder Stevens encouraged the residents in attendance, as well as any others, to keep in touch with township officials as they continued to pursue potential solutions. In other news, Catherine Rawlings of the Longwood Fire Company said the company was teaming up with the township police force to hold a blood drive on Thursday, December 14, from 2 p.m. to 7 p.m. For more information or to sign up to donate blood, Rawlings said to visit the fire company’s website.